Constant speed control mode differs from vehicle-to-vehicle distance control mode. When constant speed control mode is selected, your vehicle will maintain a set speed regardless of whether or not there are other vehicles in the lane ahead. Switch to constant speed control mode. Constant speed control mode indicator will be displayed. When in constant speed control mode, to return to vehicle-to-vehicle distance control mode, push the lever forward again and hold for approximately 1 second. After the desired speed has been set, it is not possible to return to vehicleto- vehicle distance control mode. 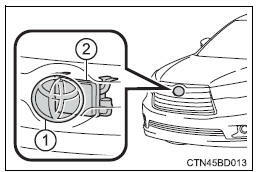 If the engine switch is turned off and then turned to ignition on mode again, the vehicle will automatically return to vehicle-to-vehicle distance control mode. The shift lever is in the d or range 4 or higher of s has been selected. Vehicle speed is above approximately 30 mph (50 km/h). The vehicle can accelerate normally. After acceleration, the set speed resumes. However, during vehicle-to-vehicle distance control mode, the vehicle speed may decrease below the set speed in order to maintain the distance to the vehicle ahead. actual vehicle speed falls below approximately 25 mph (40 km/h). The sensor cannot operate correctly because it is covered in some way. The windshield wipers are operating at high speed (when the wiper switch is set to the high speed wiper operation position). If vehicle-to-vehicle distance control driving is automatically canceled for any other reason, there may be a malfunction in the system. Contact your toyota dealer. actual vehicle speed is more than approximately 10 mph (16 km/h) below the set vehicle speed. Vehicle speed falls below approximately 25 mph (40 km/h). Always keep the sensor and grille cover clean to ensure that the vehicle-tovehicle distance control operates properly. (Some obstructions, such as snow, ice and plastic objects, cannot be detected by the obstruction sensor.) Dynamic radar cruise control is canceled if an obstruction is detected. When the dynamic radar cruise control switch is operated, a guidance display is shown on the multi-information display for a few seconds as to how to operate the dynamic radar cruise control switch or distance switch. Warning messages and buzzers are used to indicate a system malfunction or to inform the driver of the need for caution while driving. This device complies with part 15 of the fcc rules. Operation is subject to the following two conditions : (1) this device may not cause harmful interference, and (2) this device must accept any interference received, including interference that may cause undesired operation. Do not overly rely on vehicle-to-vehicle distance control. Be aware of the set speed. If automatic deceleration/acceleration is not appropriate, adjust the vehicle speed, as well as the distance between your vehicle and vehicles ahead by applying the brakes etc. Assisting the driver to measure following distance the dynamic radar cruise control is only intended to help the driver in determining the following distance between the driver's own vehicle and a designated vehicle traveling ahead. It is not a mechanism that allows careless or inattentive driving, and it is not a system that can assist the driver in low-visibility conditions. It is still necessary for driver to pay close attention to the vehicle's surroundings. Assisting the driver to judge proper following distance the dynamic radar cruise control determines whether the following distance between the driver's own vehicle and a designated vehicle traveling ahead is appropriate or not. It is not capable of making any other type of judgement. Therefore, it is absolutely necessary for the driver to remain vigilant and to determine whether or not there is a possibility of danger in any given situation. Assisting the driver to operate the vehicle the dynamic radar cruise control has no capability to prevent or avoid a collision with a vehicle traveling ahead. Therefore, if there is ever any danger, the driver must take immediate and direct control of the vehicle and act appropriately in order to ensure the safety of all involved. Switch the cruise control off using the �on-off� button when not in use. Do not use dynamic radar cruise control in any of the following situations. Doing so may result in inappropriate speed control and could cause an accident resulting in death or serious injury. on steep downhills, or where there are sudden changes between sharp up and down gradients vehicle speed may exceed the set speed when driving down a steep hill. Apply the brakes as necessary when any of the following types of vehicles are in front of you. As the sensor may not be able to correctly detect these types of vehicles, the approach warning Will not be activated, and a fatal or serious accident may result. 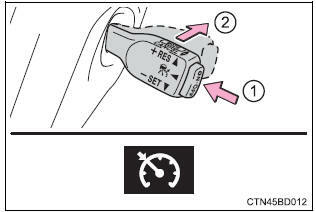 Observe the following to ensure the cruise control system can function effectively.